(PRLEAP.COM) April 24, 2018 - Ed Odjaghian, a senior IT executive with decades of experience in healthcare solution delivery, has joined Solve.Care executive team to lead the delivery function and will be responsible for delivering Care.Wallet solution to clients. Mr. Odjaghian has 30+ years of experience in various roles including healthcare solution delivery to clients. Mr. Odjaghian has spent decades managing operations of various IT companies, including software development, client services and support operations, building and leading offshore development centers and delivering enterprise level integrated solutions to government and commercial clients. At Solve.Care, Odjaghian will be responsible for the operations, processes, policies and management of client solution delivery projects. Mr. Odjaghian also brings tremendous healthcare expertise that will help Solve.Care realize its plans for rapid growth and global expansion. "I am looking forward to the opportunity to build and lead a highly effective delivery organization as part of the Solve.Care mission," Odjaghian said. "I am delighted to be part of a company that is leading the way to the future of healthcare administration around world," he added. Before joining Solve.Care, Mr. Odjaghian was the Senior Services and Solutions Consultant at Technology Consulting Services. Prior to that, he spent a decade at EngagePoint, in various roles including Senior VP of Enterprise Solutions, Senior VP of Product Development and Chief Operating Officer. 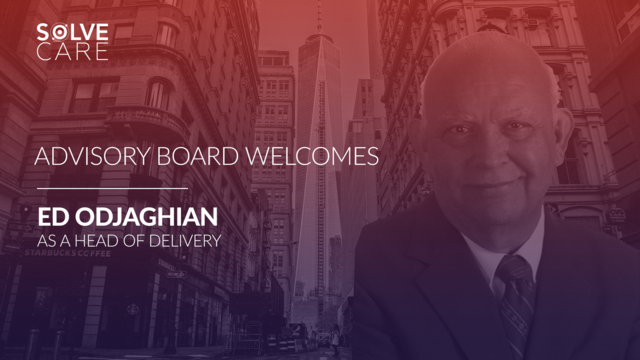 Before that Mr. Odjaghian served as the Executive VP and COO at ProfitLine. Mr. Odjaghian's path has crossed several times with the Solve.Care CEO, Pradeep Goel over the last 20 years. "I have worked with Pradeep for the better part of 20 years in many of his ventures, and have tremendously enjoyed his leadership and track record for creating a corporate culture that produces success for team and clients both," Odjaghian said. Pradeep Goel emphasized Solve.Care team's excitement about Ed Odjaghian joining them. "It is a pleasure and an honor to welcome Ed to our growing team. I'm extremely fortunate to have known Ed for a long time, and his background, approach and work ethic is perfectly suited to our company's mission and values," said Goel. "Our long history together will be very helpful as Solve.Care manages rapid growth and global expansion. I speak for the whole team when I say that we are all very excited about working with Ed."